2 x keys, 2 x alarm fob. COC available for export @ £108 extra. 1998 Kinsey Jones Ltd Lotus 998 miles – First service. 2000 Kinsey Jones Ltd 3,400 miles – A service. 2001 Paul Matty Sports Cars 16,241 miles – A service. 2002 Brooke Kensington Ltd 20,061 miles – B service. 2003 Brooke Kensington Ltd 29,519 miles – A service. 2005 49,633 miles – MOT. 2005 Mitsubishi Motors Rallart 40,813 miles – A service. 2006 Prestige Car servicing 47,735 miles – C service. 2006 50,162 miles – MOT. 2007 61,103 miles – MOT. 2008 PJS Autos 63,314 miles – Head gasket including cylinder head skim and pressure test + C service. 2008 66,252 miles – MOT. 2010 75,482 miles – MOT. 2014 78,050 miles – MOT. 2016 78,050 – C service cambelt. 2016 78,050 miles – MOT – no advisories. We bought this car as a project, as can be seen by the MOT history its had very little use over the last 5 years. Black leather interior with dark green soft top roof. 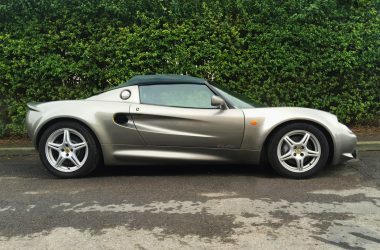 Cheapest Elise for sale anywhere! Straight car, straight chassis, HPI clear. Will be fully C serviced and Mot’d before sale/can be driven away. Really good body work apart from front clam (see bad points). Early lightweight MMC brake model. Good runner drives very well. It is being sold as a project so viewing is recommended before purchasing. Windscreen is delaminating near the edge. Interior is worn in all the usual places and could do with a re trim and a good clean. The front bonnet hinge has seized in the past and while opening has flexed the front nose and cracked the paint. Front toeing post requires replacing (a job that can be done while front clam is off for paint).